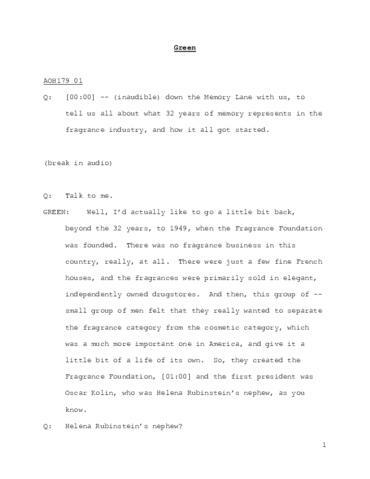 Interview with Annette Green about her work with the Fragrance Foundation, 1993 August 26. They start at the beginning of the company, Green's initial introduction and eventual rehabilitation of the foundation, and it's current position in the industry. Green discusses her involvement with starting the Cosmetic and Fragrance Program at FIT. Green also discusses her personal life, from her days as a child to her career beginnings. Recording begins to sound warped and skips a bit in the second hour. This was originally part of a larger recording that includes the Rosemarie Bravo interview. The Rosemarie Bravo interview begins at 8:45 in the third digital recording (legacy audio ID AOH79-3).